It’s been a quiet few months for Warner Bros.’ upcoming Justice League movie, following a number of photos during production and even a teaser from the San Diego Comic-Con, but now a new photo of Jason Momoa as Aquaman has made its way online from director Zack Snyder’s Vero account (view in the gallery below). 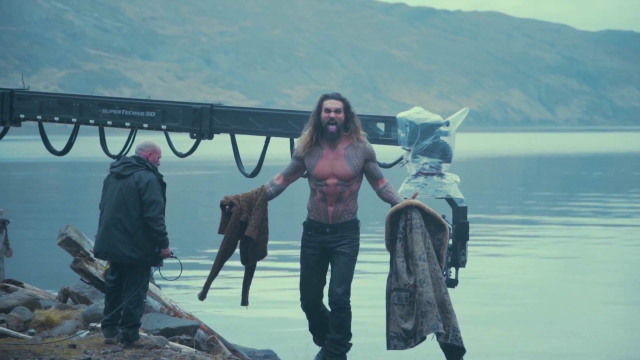 In addition, some behind-the-scenes footage from the production has also appeared online in a video that Momoa himself released, which you can find in the player below. In related Aqua-news, the Australian and Queensland governments confirmed (via THR) that the solo Aquaman film will shoot at Village Roadshow Studios in South East Queensland on the Gold Coast. Production will begin next year with director James Wan behind the camera and filming for the first time in his home country since his feature debut, 2004’s Saw. Momoa willl star in the film along with Amber Heard as his wife Mera and Patrick Wilson as his half-brother Orm, the future villain Ocean Master. It’s set for a release on October 15, 2018.